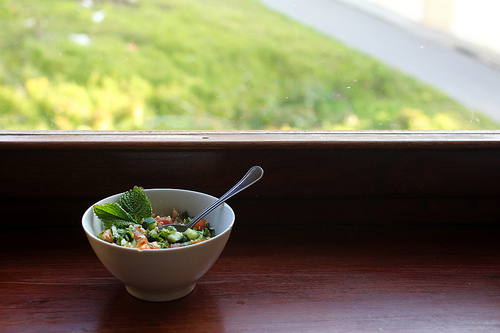 So I’ve been meaning to blog my tabbouleh recipe for many months now, but never had the presence of mind to take the accompanying photographs each time I prepared it. Tabbouleh was one of those things that I always had as a kid, not because my parents are of Middle-Eastern descent, but because it is delicious and healthy. In fact, I was often shocked that my friends at school had never heard of tabbouleh, quinoa, falafel, and other such delights. Like most kids view mac & cheese as a culinary staple, I assumed that pesto, whole-wheat pancakes, and wild rice were consumed by happy children nationwide. Several weeks ago, in desperation, I summoned a crack team of one3 to scour the city one final time. He returned with about four different types of wheat and grains but no bulgur, explaining that the Syrian grocery store was indefinitely out of stock for bulgur, but the shopkeeper had offered the others as oft-used substitutions. Nearly driven mad by my tabbouleh cravings,4 I caved and chose the likeliest-looking wheat, a type of wild barley. 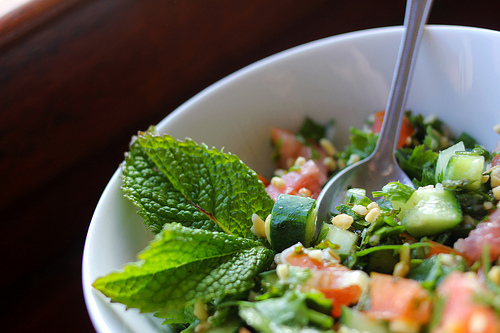 So here, without further ado, is my habit-forming tabbouleh recipe. If you live in the good ol’ USA, you should have no trouble heading out to your local grocery or organic market and purchasing quantities of bulgur that I’m sure would make me livid with jealousy. If you prefer to pretend that you live in a country where bulgur is a thing of legend, try out my recipe with barley, as I did.5 Recipe adapted from this one. Place the bulgur (or barley) in a bowl and cover with two cups of boiling water. Soak it for 30 minutes. Use this time to chop your vegetables and put them in a large bowl. Mix the salt, lemon juice, and olive oil together in a cup. Drain the bulgur. Stir it in with the vegetables. Pour the salt/lemon/oil mixture into the bowl and mix well. Chill for at least 30 minutes in the fridge. The longer you leave it, the more flavorful it becomes. Several hours or even overnight is ideal. Don’t forget to give it a little stir before serving! If you want to get fancy, garnish with mint. Feeds eight, or one of me at lunch every day for a week. Can be served with bread, but I tend to eat it unaccompanied out of a bowl.